Your choice in lush velvet upholstery colors. Versatile modern silhouette incorporates seamlessly into existing d�cor schemes. Memory foam layer sits on top of padded cushion to provide maximum comfort. I can't get enough of the furniture selection on this site!! ANOTHER GREAT PURCHASE! Soft, comfortable, excellent quality! This sofa is my favorite part of my family room! It is simple yet comfortable and I've gotten so many compliments on it. My husband and I love coming home and relaxing. You can't beat the price either which was a plus! Got this n gray. Very happy with everything. Always a satisfied customer. I ordered this in sapphire blue and it is GORGEOUS. I was hesitant at first due to the velvet but I am so very happy I did. Great color. Shipping took a bit longer because I opted for inside delivery but that was all worth it. 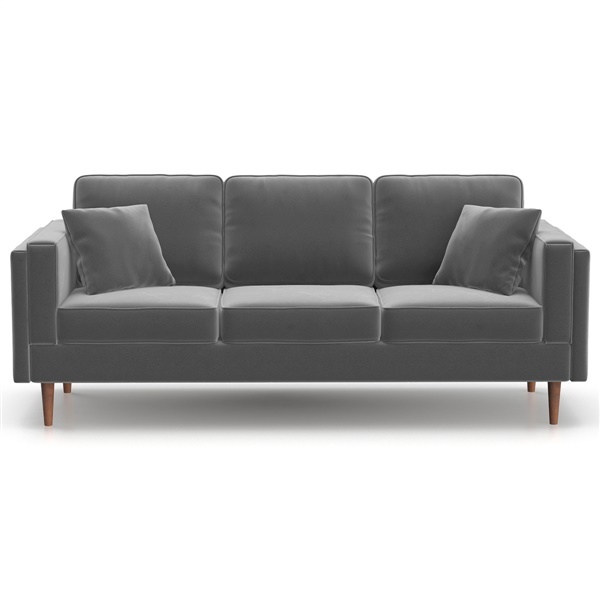 Very happy with my new sofa and am excited to show it off. ProsColor is perfect and it's very comfortable. Can we order fabric swatch? You may request swatches by emailing us at [email protected] Please be sure to include the name of the item, the colors you would like to see and your mailing address. The Sadie Velvet Sofa is manufactured in China.